When ready to cook the chicken, preheat the oven to 400 degrees F. Remove the chicken from the marinade, wiping off any excess buttermilk, and discard. Season both sides of the chicken breasts lightly with salt and pepper. 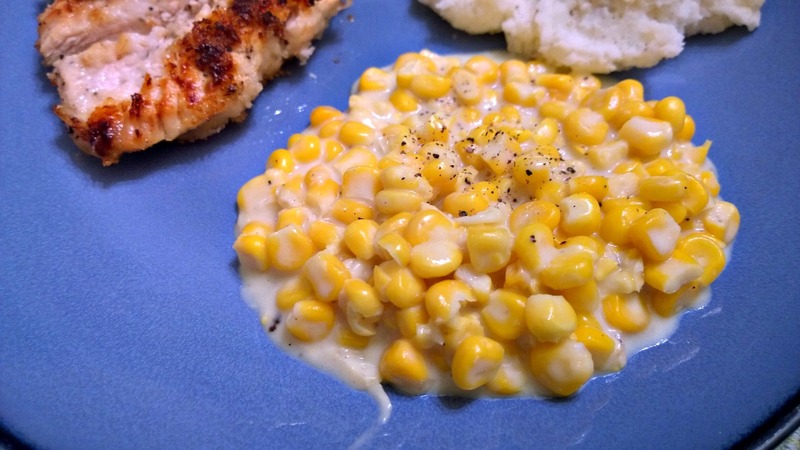 Spread the breadcrumbs out on a flat plate. 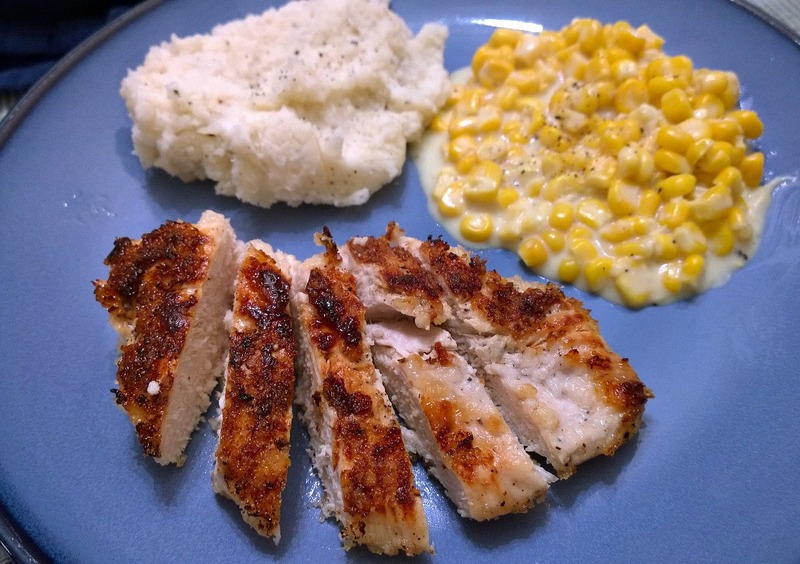 Press the chicken breasts into the breadcrumbs to completely coat all sides, shaking off the excess. Scrub and peel the potatoes. Dice into even 1/2″ cubes to even out cooking time. Place in a large Dutch oven with just enough water to cover. Salt the water and bring to a boil. Cook, covered, for 15-20 minutes, or until a fork pierces the potatoes easily. Drain the potatoes and return to the Dutch oven. 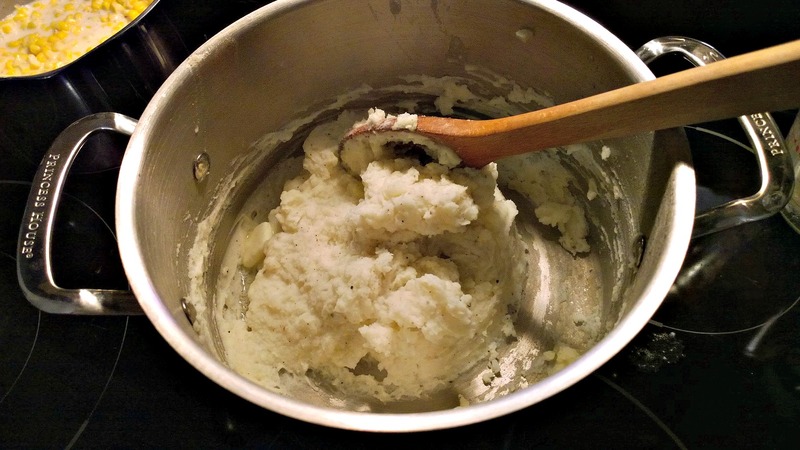 Add the cream and using a blender or a masher, mash the potatoes. Add 2 tablespoons butter and mix until incorporated. Add more cream if needed (starch may very from potato to potato). Season with salt and pepper to taste and top with remaining 2 tablespoons of butter to entice friends and family into extra big spoonfuls. Heat first 6 ingredients together in a large pot. In a separate small bowl, wisk separately the 1/2 cup milk and 2 TBS of flour (this is what will help thicken the cream). Stir into corn mixture and cook over medium heat (stir often so the cream doesn’t burn) until mixture is thickened and corn cooked through. Remove from heat and stir in 1/4 cup Parmesan cheese.